The “Sitting Epidemic” has swept across the western world, and people are growing sicker and sicker for it everyday! Children sit at school hour after hour, adolescents are seated while checking their cell phones and notifications, and hardworking adults are stuck to the computer monitors in a seated position for hours and hours every week. Hours turn to days, days turn to weeks, weeks turn to months, and months turn to years. If you are to look back on the passing time realistically how much of that time was spent sitting??? And if not sitting, how about sleeping? It is actually scary how sedentary our lives become! New societal “norms” require sitting occupations more so than standing work tasks. And the crazy part, our school habits made us think it was normal to spend our lives sitting! We were raised thinking this was okay. Dr. Levine, a lead researcher on Sitting Disease explains NEAT the following way. “Non-exercise activity thermogenesis (NEAT) is the energy expended for everything we do that is not sleeping, eating or sports-like exercise. It ranges from the energy expended walking to work, typing, performing yard work, undertaking agricultural tasks and fidgeting. Even trivial physical activities increase metabolic rate substantially and it is the cumulative impact of a multitude of exothermic actions that culminate in an individual’s daily NEAT” (Levine, 2002). What we do in our occupations has a great impact on the amount of NEAT caloric expenditure. For example, a farmer working in the fields has a much higher NEAT than a desk worker who sits all day. The farmer is moving all day, squatting down to the land, then standing up to move among the fields, walking from one crop to the next, and changing their posture constantly throughout the day to perform their many different job tasks. The desk worker on the other hand clocks in at 9 am and sits their way through to lunchtime. They are worried that if they get up to take a walk it will look like they are avoiding work. So they keep sitting and working from their desk day after day. In reality, the only time they leave their cubicle is to go to a meeting down the hall, use the copy machine, or fill up their coffee in the break room. This minimal amount of activity exerts a very low amount of calories per day. Humans were designed to move, we were designed to be athletic, mobile, and agile. We were not designed to be bound to a chair. Levine continues, “NEAT could be a critical component in how we maintain our body weight and/or develop obesity or lose weight. The mechanism that regulates NEAT is unknown. However, hypothalamic factors have been identified that specifically and directly increase NEAT in animals. By understanding how NEAT is regulated we may come to appreciate that spontaneous physical activity is not spontaneous at all but carefully programmed” (2002). Our brains are wired for movement, and our bodies are designed for dynamism. To offset the ill health effects of “Sitting Disease” or the chronic diseases that are directly correlated with a sedentary lifestyle, it is recommended to increase bouts of movement throughout the day. What if I Workout in the Morning Before Work? Working out, spending 30 minutes to an hour in the gym is a great lifestyle habit. However, if you have a seated occupation, it’s not enough. In fact Levine describes that working out for an hour per day is not enough to offset a sedentary lifestyle. You must increase NEAT caloric expenditure. Meaning, that working out is great… definitely don’t stop going to the gym or doing your daily training. However, also be cognizant of how much you are moving the rest of the day. Increasing the amount of movement that you do throughout the day is your best solution to increase NEAT caloric expenditure. How many calories can you expect to burn if you stand instead of sit as part of your workday? If sitting computer-time were replaced by walking-and-working, energy expenditure could increase by 100 kcal/h. Thus, if obese individuals were to replace time spent sitting at the computer with walking computer time by 2–3 h/day, and if other components of energy balance were constant, a weight loss of 20–30 kg/year could occur (Levine et al., 2007). How Can I Burn More Calories at Work while Staying Productive? You can increase NEAT without decreasing productivity! If anything, you will be more focused and more productive in the workplace. In fact, researchers evaluated productivity of workers with adjustable desks allowing you to sit and to stand. The workers can adjust the heights of their desks to sit and stand while performing their occupational tasks. Garrett et al. (2016) explains that many office employees are spending up to 90% of their workday seated, and employers are considering stand-capable desks as a way to increase physical activity throughout the day. When deciding on adoption of stand-capable workstations, a major concern for employers is that the benefits, over time, may not offset the initial cost of implementation. The researchers found the following results. “Users of stand-capable desks were ∼45% more productive on a daily basis compared to their seated counterparts. Further, productivity of the stand-capable desk users significantly increased over time, from ∼23% in the 1st month to ∼53% over the next 6 months. Finally, this productivity increase was similar for employees across both job categories. These findings suggest important benefits of employing stand-capable desks in the workforce to increase productivity” (Garrett et al., 2016). 1) Get a Sit-Stand Capable Desk: Set yourself up for success with the tools you need to increase NEAT. Having a desk that allows you to go from sitting to standing is a great way to increase NEAT. Although you don’t have to stand all day, you can sit and stand. An ideal ratio is standing for three times longer than you sit. With adjustable workstations you can take breaks as needed, but plan to spend the majority of your time standing. 2) Walk While You Work: Take walks while you work to increase NEAT. Remember, your brain and your body was designed to move, not to be stagnant. Walk throughout your workday. A great strategy is to get a treadmill desk allowing you to walk while working at your computer. Plus, list out 3 activities you can do while walking instead of sitting. For example, walk and talk on the phone, do walking meetings, and walk up the stairs instead of taking the elevator. 3) Change Your Posture Often: Again, we were designed to move. The structural framework of your body, your posture was not designed to hold you upright in a static position without movement. We are dynamic beings. When posture becomes sedentary what tends to happen is that your posture distorts and you see posture faults such as forward head posture and slouched shoulders. Changing your posture from sitting to standing is important. Also, take the time to perform a Posture Break every hour. To prevent forward head posture and shoulder anteriority that occurs due to gravity, perform a Posture Break where you draw your shoulders, arms, and head back while pushing your chest forward. Change your posture often to increase NEAT and prevent postural distortion patterns. 4) While Seated Sit on an Exercise Ball: Another way to change your posture often is to sit on an exercise ball at work instead of an old office chair. Exercise balls are more dynamic, meaning you engage your muscles more actively to sit on them. This helps promote good posture, you tend to move more than while sitting on a normal office chair, and it helps improve balance by stimulating the vestibular system for better equilibrium and balance-ability. 5) Perform Balance Training While Waiting in Line: Maximize your time at work by being more active. While standing in line, instead of grabbing your cell phone and looking down in poor posture, you can be active by performing balance training. Stand on one leg with proper posture to improve balance; this is a fundamental aspect of human performance. Stand on one leg in good posture and balance for 30-second intervals, then switch legs and perform One Leg Balance bilaterally. These 5 NEAT ways to increase your caloric expenditure at work can transform your life. By being active at work you can prevent obesity, metabolic disease, and posture faults leading to musculoskeletal injuries. Your occupation is a great part of your life. 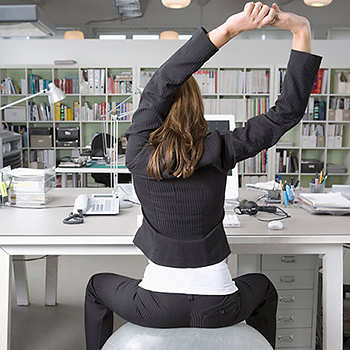 Maximize your work capacity while staying healthy in the workplace. This commitment to your health will have a high payoff return on investment of your health, happiness, and wellbeing.